The popadome tree cover is a unique fruit protection system and gardeners everywhere are using them either singly or in multiple arrangements for larger areas. 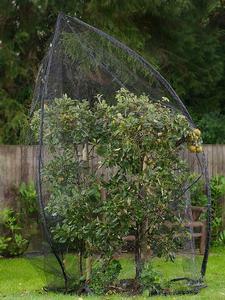 It very simply wraps round bushes and trees and then is zipped up to keep out the smallest birds. The fine black 10mm square mesh protects your plants from birds, butterflies, chickens, cats and dogs but allows pollinating insects such as bees through. Easily assembled using fibreglass poles and can be anchored to the ground with an 8" tent peg and by enclosing the tree/bush will not blow away. Sturdy and lightweight means it is easy to put in place and relocate. The popadome weighs just over 1.7kg and comes in a handy carry case for easy and safe storage. Ground coverage: 2.5m diameter approx.